Tandem skydiving is ideal for all those who want to experience free fall without the hassle of learning parachuting theory. Makes an unusual gift. During a tandem jump you will be attached to a professional parachutist (so called tandem master) by a special double harness. After a pre-jump training where everything will be explained to you, you will be climbing up the sky in an airplane, having the opportunity to enjoy the beautiful landscapes below you. You will exit the plane in 4000 m and experience up to 1 min of free falling. Your parachute will then open in 1500 m, and you will be slowly gliding to the ground under a ram air parachute, which you can even try to steer. 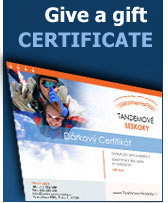 After the jump you will get a certificate – a proof of your skydive. If you wish, the whole skydiving experience may be recorded for you by a professional cameraman and made into a DVD or still photos. You will be able to share this unique momentum with all your kith and kin. What do You Need to Jump? When you jump in tandem, you don’t need any special medical certificate or profound training (all you need is only a 10-minut orientation before the jump itself). Basically anyone older than 10 years without a serious medical condition can jump. Our oldest passenger was 94 and we likewise have experience with people with physical disabilities. You don’t need any special kind of clothing, however, we recommend something comfortable. If you wish, we will provide you with a skydiving jumpsuit. We jump from March till November. We are ready to meet any day in any location in the Czech Republic you would require. For more information please contact us on our info line 777 062 699 or submit an online order. For more information about airports and their schedules click on the particular link in the left side menu.